The Twardowskis are back with an accessible tour of one of the most historic sites in America. Learn how to make the most of your trip to this cultural center of the country. Walkable Boston blends nearly 400 years of history with an abundance of green spaces and a beckoning waterfront. This modern east coast capital is a great American city and a "must see" destination. Navigating a historic city can present challenges for wheelchair users. 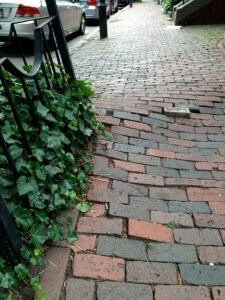 The charming streets made of cobblestones and setts (small, rectangular pavers) create an uneven, precarious surface. Maneuvering, especially in a manual wheelchair, can be difficult and jarring. You'll encounter these surfaces beside Faneuil Hall, the Paul Revere House, at the front of the Old State House and in Beacon Hill. The sidewalks are narrow and streets steeper in Beacon Hill and Little Italy--some folks might prefer seeing these charming areas from their car. We took in the sights using a manual wheelchair and a great deal of muscle. Boston is packed with wheelchair-friendly attractions. Being such a popular tourist destination brings in the crowds year round. The peak season is April to June and September to October. You can often by pass the lines with a CityPASS booklet which includes admission tickets to five attractions at nearly half the cost. Located at the Central Wharf, the recently renovated New England Aquarium offers free admission to visitors using wheelchairs or with visual impairments. Guide dogs and service dogs are welcomed. Five complimentary manual wheelchairs may be borrowed on a first come, first served basis, at the Information Desk. Handicapped parking information can be found online here. The floor to ceiling glass viewing areas, designated wheelchair seating at the IMAX, accessible restrooms, and elevators make the aquarium a good choice for wheelchair users. The one hundred-year-old Boston Children's Museum opens early for children with special/medical needs on select dates. To keep the crowds small, the museum limits the number of guests inside the facility to 100. Preregistration is required to participate in the Morningstar Access program. Call 617.986.3697 and ask for the Health and Wellness Educator. Adult and child size wheelchairs may be borrowed at the museum. Family restrooms are located on every floor. The museum does not have a parking garage and finding a spot can be difficult. Lunch at one of the many restaurants beside the water. The flagship restaurant for Legal Sea Foods, Legal Harborside, is in the Seaport District. The 20,000 square foot restaurant rolls out a different dining concept and menu on each of its three floors. We chose the casual first floor hull with an oyster bar, picnic tables, and a water view. The wheelchair-accessible Institute of Contemporary Art/Boston is a short walk from the restaurant. The brick lined 2.5 mile Freedom Trail passes 16 historically significant sites. The collection features churches, burying grounds, parks, meeting houses, museums and a ship with markers describing the story of the American Revolution. 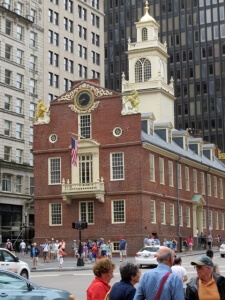 The Freedom Trail is wheelchair accessible, but many sites are not. Audio tours are available to rent at the Boston Common Visitor Information Center or download an MP3 version on the Freedom Trail's online shop www.thefreedomtrail.org. Two ways to admire Boston's architecture is from the fifty-story high Prudential Center Skywalk Observatory. On a clear day, you can see a panoramic view of up to 100 miles away. Another option is boarding a Boston DUCK tour. The WWII style amphibious landing vehicle tours the streets past historic sites and splashes in to the Charles River. Each of the company's 28 DUCKs has two designated wheelchair seats and a wheelchair lift. Which landmark sites you see depends upon where you board a DUCK. Review the company's website (http://www.bostonducktours.com/the-tour/) for a complete list of tour choices. The first public botanical garden in America was planted in Boston. The lush pathways and a lagoon at the Boston Public Garden make a beautiful background for pictures. 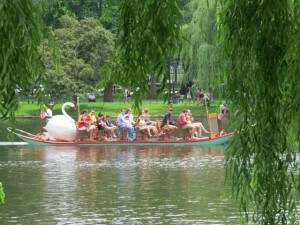 Manual wheelchair users can ride the more than 130-year-old Swan Boats. Tucked throughout Boston are dozens of parks. These shady green spots, often with sculptures, provide a calming break. To plan your visit to Boston, consult the city's official tourism website,www.BostonUSA.com, for attractions, lodging and event information.